Phuket (Thailand) – July 14, 2018 (travelindex.com) – How to build a Yacht Charter Global Digital platform for Individuals to assist, facilitate, with wide Choice & High-Standard Service ? With Immediate booking & Large fleet Yachtside label with +150 Yachts available. Not just another one of the many digital companies out there’ trying to conquer the Charter Yacht market, Yachtside Charter is above all a professional charter brokerage company whose founders total more than 40 years of experience in Yachting. So what does YACHTSIDE Charter bring to the table? The accessibility in 1 click to all available yachts in the fleet in real time while maintaining the human contact with a charter broker professional that will answer all your questions via live chat or by telephone. 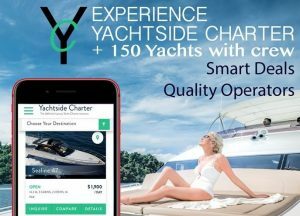 – YACHTSIDE Charter has a revolutionary comparative algorithm built into the platform to help the client compare and visualize the yachts on offer like never before. – Instant quotation and pricing offered in several currencies to know exactly what the cost will be. – High quality video presentation of the yachts on offer to help ease any doubts a client may have. – Receiving an easy to complete e-charter agreement that can be validated with 1 click. – As Easy As Booking An Hotel Room Online. With YACHTSIDE Charter makes comparing, booking and managing private yacht charters easier than ever before. With MYBA & MCA standards All professionals to join the CharterYacht Web-app are audited by an surveyor and are obliged to satisfy drastic specifications in which, in addition to the business itself, each of its products and services is audited prior to approval. For us, the digitizing luxury does not mean reducing the level of excellence brought by human service, CharterYacht Web-app has combined its strong human and operational experience with the transition to digital, offering you the guarantee of an immediate, efficient, luxurious and personalized service. Start with a fleet of around 150 Yachts, offering a wide choice of very recent, high spec models under a strict quality control to ensure only the best for our clients.